"Sampath Speaking" - the thoughts of an Insurer from Thiruvallikkeni: GST to roll-out from today's midnight !! A gong will be sounded at midnight to signify that GST has arrived. GST will simplify a web of taxes, regulations and border levies by subsuming an array of central and state levies including excise duty, service tax and VAT. It is expected to gradually re-shape India's business landscape, making the world's fastest-growing major economy an easier place to do business. Today, it is going to be a starry midnight in the historic Central Hall – pitching in people from megastar Amitabh Bachchan to industry doyen Ratan Tata in attendance at the launch of Indias tax reform, GST. Unlike the last midnight event held in 1997 on the occasion of golden jubilee of the Independence at a special session of Parliament, it will be a gala event at its circular - shaped hall that has been loaned for the launch of the historic reform. Reminiscent of India's tryst with destiny on the midnight of 15 August 1947, the event will be graced by President Pranab Mukherjee and Prime Minister Narendra Modi. Former prime ministers Manmohan Singh and HD Deva Gowda too have been invited to launch a new taxation system that is set to dramatically re-shape the over $2 trillion economy. Shopaholics are on a high. With hours to go before GST kicks in, retailers across the country — from Big Bazaar to Amazon —are leading a last-minute charge to clear stocks. Consumers are treating it as an opportunity to stock up, as there are discounts galore. As usual, people will end up buying even material those are not wanted or in excess of their need, lured by the so called high discounts and sellers will make a big bonanza. Some retailers have already announced keeping open its doors till midnight [serving whom !] 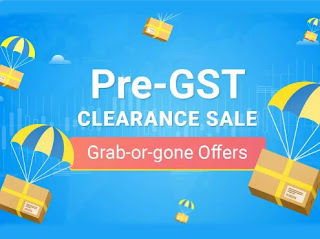 while couple of e-tailers have started pre-GST sale from Wednesday midnight itself. GST - Goods & Services Tax is a comprehensive, multi-stage, destination-based tax that will be levied on every value addition. To understand this, we need to understand the concepts under this definition. Let us start with the term ‘Multi-stage’. Now, there are multiple steps an item goes through from manufacture or production to the final sale. Buying of raw materials is the first stage. The second stage is production or manufacture. Then, there is the warehousing of materials. Next, comes the sale of the product to the retailer. And in the final stage, the retailer sells you – the end consumer – the product, completing its life cycle. GST is not a new phenomenon. It was first implemented in France in 1954, and since then many countries have implemented this unified taxation system to become part of a global whole. The launch event will start at 11 pm on 30 June and extend into the midnight, coinciding with the rollout of the Goods and Services Tax (GST) regime, official sources said. The Congress party has, however, decided to boycott the event apparently to protest against hardship being caused to small and medium enterprises and traders. The Left and TMC too are boycotting the event. Lok Sabha Speaker Sumitra Mahajan and Vice President Hamid Ansari will also be on the dias along with the President, Modi and former prime ministers. Legendary singer Lata Mangeshkar will be among the attendees, which also includes BJP president Amit Shah and former finance minister Yashwant Sinha. Former GST Council chairman Sushil Kumar Modi, former finance ministers of West Bengal and Kerala Asim Dasgupta and KM Mani too have been invited. CAG Shashi Kant Sharma and his predecessors Vinod Rai and TN Chaturvedi, CVC KV Chowdary, three Election Commissioners, including CEC Nasim Zaidi, Niti Aayog vice chairman Arvind Panagariya, Metro man E Sreedharan, editor S Gurumurthy, agriculture scientist M S Swaminathan, UPSC Chairman David R Syiemlieh, CBEC chairman Vanaja N Sarna and CBDT chairman Sushil Chandra have also been invited. Senior lawyers Soli Sorabjee, KK Venugopal and Harish Salve as also heads of industry chambers - Pankaj Patel of Ficci, Shobana Kamineni of CII and Sunil Kanoria of Assocham too are on the list of invitees. The GST Bill was originally piloted by Mukherjee when he was the Finance Minister in the previous UPA regime. The GST Council, that brings together the central and state governments, has met 17 times to thrash out how the tax will work. The historic Central Hall was thought to be a better choice considering the importance of the new indirect tax code that unifies more than a dozen separate levies to create a single market with a population greater than the US, Europe, Brazil, Mexico and Japan put together. A four-rate structure that exempts or imposes a low rate of tax of 5 percent on essential items and top rate of 28 percent on cars and consumer durables has been finalised. The other slabs of tax are 12 and 18 percent. Any manufacturer, trader or service provider whose turnover is above Rs 20 lakh (Rs 10 lakh in the case of northeastern and special category states) have to get registered for GST. Businesses whose annual turnover is below Rs 20 lakh or independent professionals whose annual income is below this threshold need not register for GST. Any business which is making or trading items that are exempt from GST or attract zero percent GST need not register. Businesses which were registered under service tax (the threshold was Rs 10 lakh) need not migrate to GST if the turnover is less than Rs 20 lakh. Those below the threshold of Rs 20 lakh can register for GST if they want to be part of the input tax credit chain. Even critics have not stated that commoners will be hit. Most of the items of daily consumption are in the zero percent or 5 percent tax slabs. Even in the case of other items in higher slabs, the GST rate is generally in the same range as what the combined tax incidence was earlier. For example, if the combined incidence of excise, central sales tax, octroi, VAT or other local taxes was 16 percent earlier, the GST rate on the product now will be either 15 percent or 18 percent. But it is not likely to have come down to 12 percent or gone up to 28 percent except in rare cases. So, in most cases the consumer will not see much of a difference. If so, what is the hype about ? I need the GST rates for gold chain. I have decided to buy the gold coin and chain for my sister. Next week engagement function will be conduct in my home. My friend and uncle to helping me to select the best design for her. I am getting all related news and business GST registration works from online. I have collected more important information and methods from my pages. I am getting the best group for getting the discussion and good process for GST registration. i am getting the new business. I need to collect the gold and metals buying price and what are the GST rates are added for that. I have searched more times in online. But i cannot get the exact details. Please share me the accurate information and details here. I have applied the best sources for online. My friends and supportive person are given their thoughts and reviews in my mail box. I am saving all the GST rates and news in my drive. I have used the best online method for collecting those details. I am choosing the best wedding design in online. It is getting good color and matching with the wedding saree. My sister is also really like to buy that. I am very happy. Price is also considering for GST rates. But the bill is not getting the GST rates as separate. It is added with prices. I cannot find the exact GST rates for that. How to find it? Did you get any idea for collecting those details? I am needed the GST news and updates. I have collected the reference links and articles for online. It is really nice and getting good updates also. I need to get the real sources and pages here. Please help me to know about that.